The Acropolis in Athens, Greece is a large rock with a flat top that towers 490 feet (150 meters) above the Valley of the IIissos River. The Acropolis was once used for defense. It also provided sanctuary for the people of Athens in times of distress. In fact, the word "acropolis" can refer to any high, fortified ground. However, when we speak of "The Acropolis" we are speaking of the historic Athenian site, which has been declared a UNESCO World Heritage site. According to Greek mythology, the Acropolis is the place where the goddess Athena and the god Poseidon fought over which one of them would become the city's patron. Athena won, so the city was named after her. The Acropolis has been inhabited since Neolithic times. Pottery shards from between 4000 and 3000 BC have been found there. Most of the structures that are now on the Acropolis are remains of buildings that were built around the 5th century BC. Although the Acropolis was important to the Athenians long before that time, many older buildings were destroyed by Persian invaders in 480 BC. Starting in 460 BC, and for about 30 years after, during what was has become known as Athens' Golden Age, many temples were built on the Acropolis, sometimes using the foundations of older structures that had been mostly destroyed. This huge building project was the brainchild of Pericles, the great Athenian statesman. Many of the structures on the Acropolis were designed by the architects Ictinus and Callicrates and the sculptor Pheidias. There is a huge gateway, known as the Propylaea, at the entrance to the Acropolis. The stairway leading up to the entrance marked the final steps on the road, known as the Sacred Way, which stretched from Eleusis to Athens. The Erechtheum, a temple to Athena, is supposed to have built on the spot where, after she won the contest against Poseidon, Athena touched her spear to the ground and made an olive tree grow. The Erechtheum is supported by sculptures of girls known as Caryatids. Of all the buildings on the Acropolis, the Parthenon, which was completed in 438 BC, is the most famous. The Parthenon is an enduring symbol of ancient Greece. Dedicated to Athena, it contained a giant bronze statue of the goddess. It was built on the site of an older temple to Athena that was destroyed by the Persians. 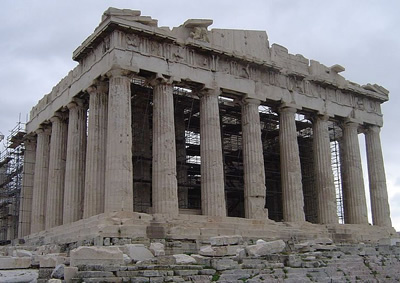 46 outer columns and 19 inner columns supported the Parthenon's roof. These columns were thicker in the middle than at the ends, which, because of an optical illusion, made them appear straight and symmetrical. At the eastern end of the Parthenon, there was a sculpted pediment showing Athena being born from the head of Zeus. A pediment at the western end illustrated Athena's contest with Poseidon. In the 6th Century AD, the Parthenon was converted to a Christian Church, dedicated to the Virgin Mary. In the 11th century, it was the city's Cathedral. Venetians bombed the Parthenon in 1687. In the early 1800s, Great Britain's Lord Elgin took marble decorations from the Parthenon and brought them back to England. The British Parliament purchased these decorations from Elgin in and donated them to the British Museum.